Ever Wonder... Why Do We Use a Whole Rest in 2/4 Time? Have you ever had a student ask "Why do we use a Whole Rest in 2/4 Time?" or "Why can't we use a Half Rest for a whole measure of silence in 2/4 Time?"? Although a great answer is always "Blame Bach - he set the rules", it is nice to actually understand the reason behind the rule. 2/4 Time is a Simple Duple Time Signature. In a nutshell, a Simple Time Signature has a top (upper) number of 2, 3 or 4. Duple means that there are 2 Basic Beats. Therefore, with a top number of 2 in the Time Signature and 2 Basic Beats, 2/4 Time is a Simple Duple Time Signature. The Whole Rest Rule is - A Whole Rest is used for a Whole Measure of Silence in any Time Signature (except in 4/2 Time). For Students to really "get" this, I like to have fun and say: "The Whole Rest Rule is - A WHOOOOOOOOOOOOOLE Rest is used for a WHOOOOOOOOOOOOOLE Measure of Silence in any Time Signature (except in 4/2 Time).". Really stretch out how long you say your "O" vowel so that it visually and aurally sounds like it is filling that measure. In Simple Duple Time, that pulse is Strong Weak (S w). In Simple Triple Time, that pulse is Strong Weak Weak (S w w). In Simple Quadruple Time, that pulse is Strong Weak Medium Weak (S w M w). In 2/4 Time, it is more important to show that the Whole Measure is silent, and not that you just have 2 counts of silence. In 3/4 Time, it is more important to show that the Whole Measure is silent, and not that you just have 3 counts of silence. In 4/4 Time, even though the Whole Rest "technically" receives 4 counts, it is more important to still think of this as the Whole Measure being silent. Yes, a Half Note will fill a whole measure in 2/4 time with sound but you must use a Whole Rest to fill a whole measure in 2/4 with silence. So why don't we use a Whole Note for a whole measure of sound in 2/4 Time? Simple - the pulse for a Whole Note is 4 Beats: S + w + M + w. For a whole measure of sound in 2/4 Time, we need 2 Beats: S + w.
As silly as it may seem, you can use a Half Note in 2/4 Time, but you cannot use a Half Rest. You can use a Whole Rest in 2/4 Time, but you cannot use a Whole Note. I like to tell my students that the Whole Rest is the Super Rest! Yup, it has Super Powers and can make a Whole Measure be silent in any Time Signature (except in 4/2 time). When a student questions why, for example, they can have a dotted quarter note in 2/4 time, but not a dotted quarter rest, I explain that Rests have Rules. These Rest Rules are based on the pulses (and we use the Plus + and Tilde ~ Signs to join or not join into one rest). 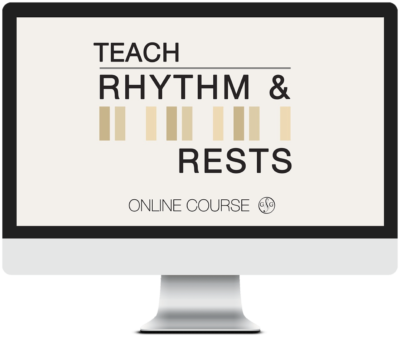 Rest Rules are so important, we begin teaching the Rest Rules in Prep 1 Rudiments! Notes are lucky - they can be syncopated and do lots of funky rhythms that rests can never ever do! Remind your students that Rests have RULES! 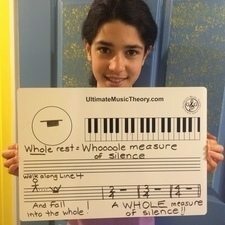 Enjoy teaching your students that a Whole Rest is a Whole Measure of silence (and really stretch your "O"s)! When your student gets to Basic Rudiments, you can add the exception to the rule. 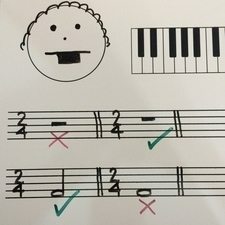 Need to teach a Whole Rest in 2/4 Time? Use your Whiteboard! Explaining to a student why we have to use a Whole Rest in 2/4 Time is EASY using your Whiteboard! Have Fun Learning a New Concept! Have Fun Reviewing a Concept! And did I mention how much fun my students have with their Whiteboards? LOL. Please click here to see how you can easily get the Whiteboards for your Studio - we even have a Whiteboard Special for Teachers!